Built of the same yellow sandstone as the Jaisalmer Fort, Himmatgarh Palace is a perfect counterpoint to the desert. It offers all modern conveniences along with the perfect location, offering a breathtaking view of the entire Fort. The 22 year old property is spread across acres of land, strategically placed at a height which allows for a splendid view of the surroundings. 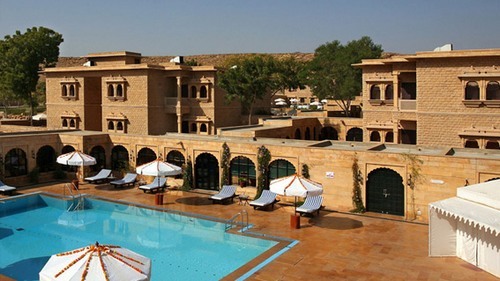 Located opposite Vyas Chhatris (or the Sunset Point as it is called), Himmatgarh Palace provides a breathtaking view of the entire Jaisalmer Fort. It enjoys proximity to other places of tourist interest within the city and is just 3 kms away from the Fort and bus stand while the railway station and airport are approximately 4-5 kms away. Please note, the airport is operational from October to March only. Recreational facilities include a swimming pool and a massage parlour, where a full body massage costs approximately Rs. 1000. Besides making arrangements for sightseeing, the hotel also organises live entertainment in the form of folk dance and music performances for groups on request. Internet facility is offered at the reception at a charge of Rs. 2 per minute. Other facilities available Himmatgarh Palace include a souvenir shop, travel desk, car rental service, currency exchange, doctor on call, laundry service and parking facility. Fort the convenience of guests, the hotel offers airport/railway station/bus stand transfers on request. Himmatgarh Palace offers comfortable accommodation in 40 well furnished rooms that include 20 Deluxe Rooms and 20 Tower Rooms. The tower or 'burj' shaped cottages are located adjacent to the swimming pool and offer easy access to sunset point within the property. The common in-room amenities include cable television, intercom telephone, air conditioner, study table, luggage rack and cupboard. The attached washrooms are appointed with soap, shampoo, shower cap, linen and receive a continuous supply of hot and cold water. Himmatgarh Palace has a multi cuisine restaurant that serves delectable Indian, Chinese and Rajasthani fare besides select Continental delicacies. The hotel serves a wide range of liquor brands at the Rampart Garden adjoining the restaurant. Guests can also enjoy in-room dining through room service, which is available round the clock. Don't Miss:The splendid view of the Jaisalmer Fort and the Vyas Chhatris from the hotel's sunset point near the swimming pool. Sip a refreshing drink while you watch the sun set on the horizon.